We finally got the rebuilt Hayabusa motor back form the engine builder on Friday, October 11th. This only gave us a few days to get every thing installed and ready for the trip to Bonneville on Monday. We weren't ready to try to start it until Sunday morning, less than 24 hours before we were planning to leave for the salt. With the new motor’s high 14:1 compression it was difficult for the starter to spin it over and we wound up backfiring a few times. Unfortunately, this destroys the starter motor clutch and soon we could no longer turn over the motor using the starter. This meant we needed to push start the car until we could find a new clutch. 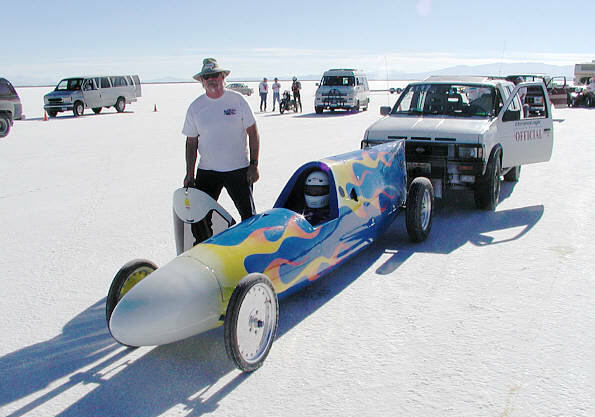 We did start the motor on Sunday to break it in before the trip to Bonneville and to be sure it would run but we were not able to do much of the tuning we had planned on. Monday, October 14th we all meet at my house in Tustin, including Wally Ross our selected crew member. We were on the road soon after 8:00 am but with a few scheduled stops. 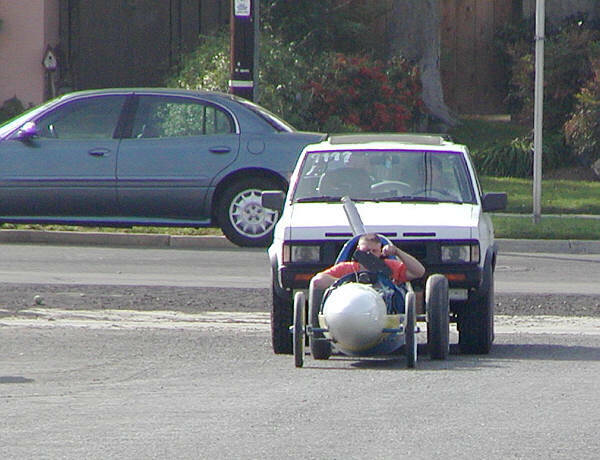 James & Mark went to Composite Sports to pick up our new scoop. Paul had worked late into the night to finish it in time for our trip and we couldn't leave home without it. We stopped in Las Vegas long enough for gas and to see if the local dealers had a starter clutch, none were available. The rest of the trip to Wendover was long and uneventful except for the brief view of a rocket launch from Vandenburg. 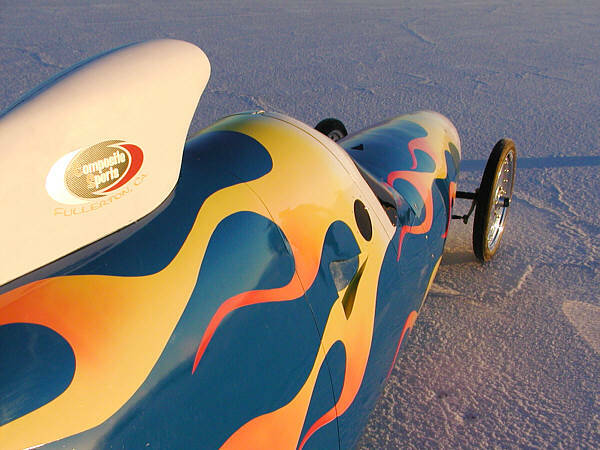 Tuesday we drove onto the salt to start setting up our pits and to set up the timing equipment. The Salt was a little wet but still very hard. 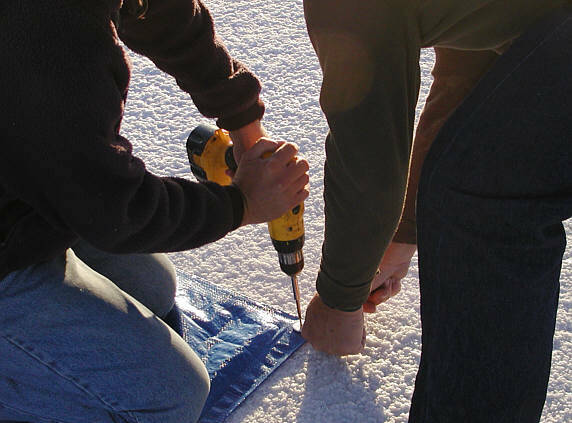 To hold down the required ground cloth (tarp) we just drive large screws down into the salt. It takes a power drill since the salt is only a little softer than asphalt. We push started the car a few more times to try to work out any issues before we took it to the track and discovered that we were having trouble keeping it running. That night at dinner we decided that we should look at the fuel pump as a possible source of the motor’s difficulty. 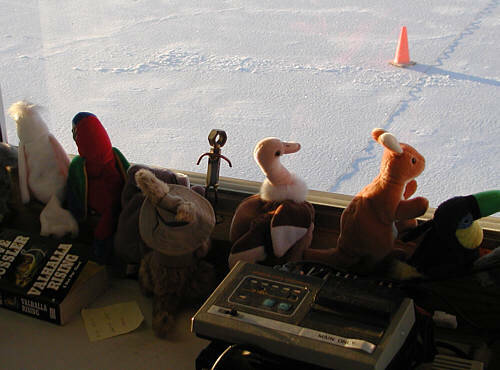 Wednesday morning James was working in the timing tower while Mark, Wally & I rigged up a fuel pressure gauge and discovered that the fuel pump was not putting out enough pressure. We disassembled the pump and found a pinched O-ring. We could not find an adequate replacement on the salt (even though we and many other teams carry O-ring kits) but Mark managed to fix the old one enough to build the required pressure. 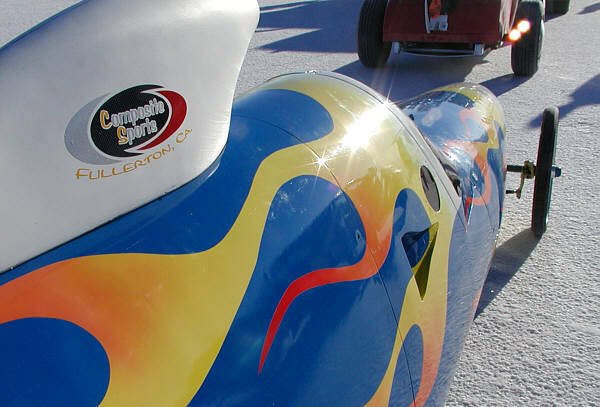 With the motor running now we headed for the staging lanes to wait for our turn on the track. Another problem we found appeared to be a stripped spark plug hole. 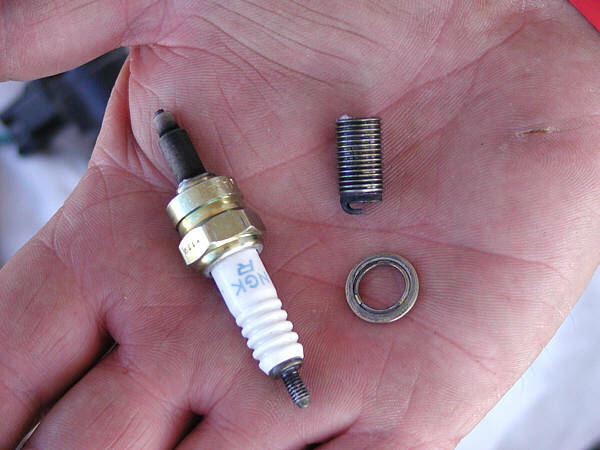 Fortunately, it was just a bad spark plug. 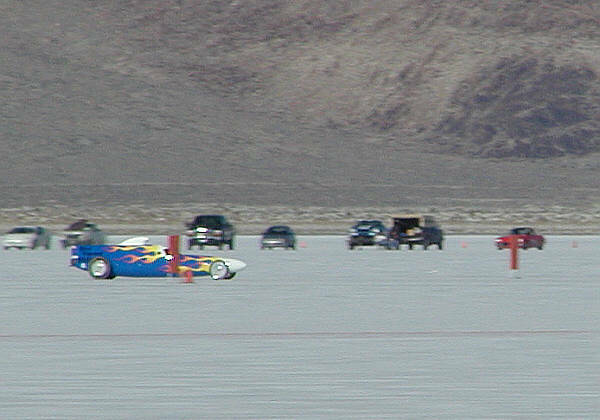 Since the salt was good and the Utah Salt Flats Racing Association had to cancel their September event due to rain, there were a lot of competitors waiting to run. 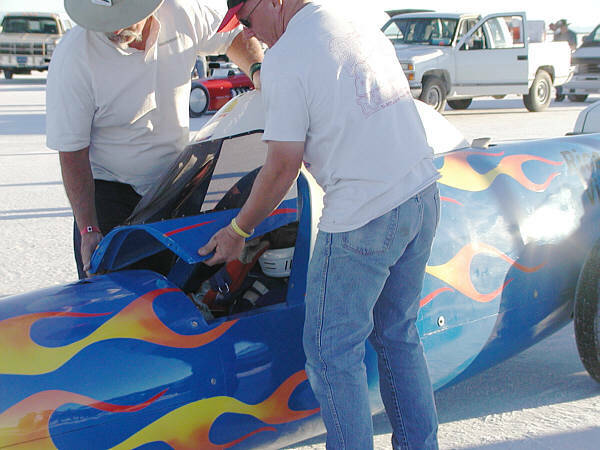 Over all there was more than 130 teams at an event designed for about 60 vehicles. This many competitors combined with the delays caused by breakdowns and FIA runs (Special world record attempts only available at this meet) caused long waits at the starting line. The real problem for us was that we wound spending a lot of time in line that would have been better spent in our pits debugging the motor. For our first (and only) run on Wednesday we had decided to make sure that the motor was very rich since we weren’t sure how much fuel the new motor would need. We expected the motor to run fairly poorly with all of the extra fuel but additionally, the motor seamed to surge with power then suddenly drop off and barely run. This issue continued to plague us all week, and without being able to easily start the motor while in the pits, combined with the very long waits at the starting line, we never managed to work it out. Thursday we cut a new hole into the top of the motor cowling so that we could attach the new scoop. 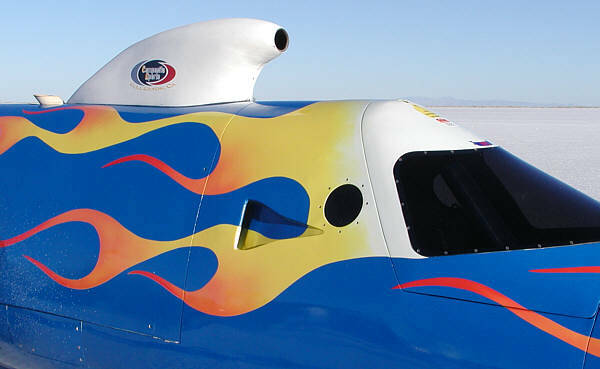 This scoop is designed to build almost one PSI due solely to the force of the air entering the opening. Thursday afternoon we meet Richard form Southwest Superbikes. 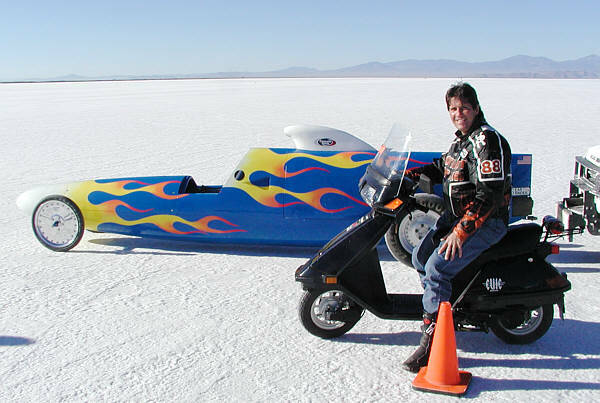 Richard had come to the salt with a bunch of fast bikes and four friends and the intention of getting all of them over 200 MPH. Fortunately for us he knows his way around a Hayabusa motor and when we wasn’t sending one of his buddies down the track he was hanging out with us trying to shake loose the gremlins plaguing our car. With the extra long waits to run we were only making one pass per day, with most of the time being wasted standing in line. By Friday morning the BNI officials had decided to add an extra day to the meet, extending it through Sunday noon. Unfortunately this didn’t help our speed attempts since Mark needed to be heading back by Saturday afternoon. By Saturday we had only made 5 runs, most of them toping out at about 170 mph. This is a far cry from the 200 we should have been able to do. Saturday afternoon Mark and Wally headed back towards Southern California while James & I stayed on to continue timing the other competitors. 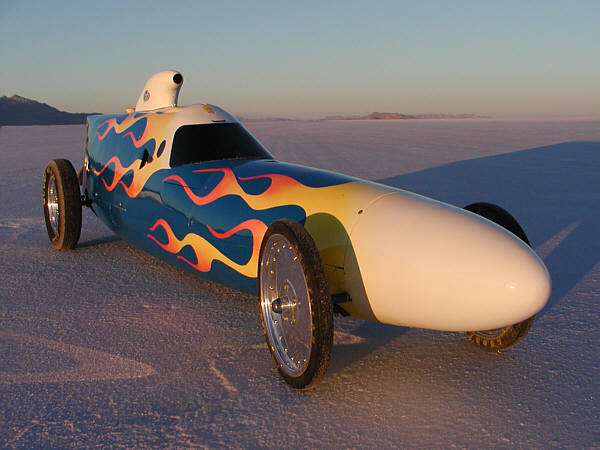 By Sunday morning all but one of Richard’s friends had ridden over 200 mph. Late in the morning, the last one managed to cross a timed mile in 17.9986 seconds, which is only 1.4 thousandths of a second quicker than he needed to go 200! 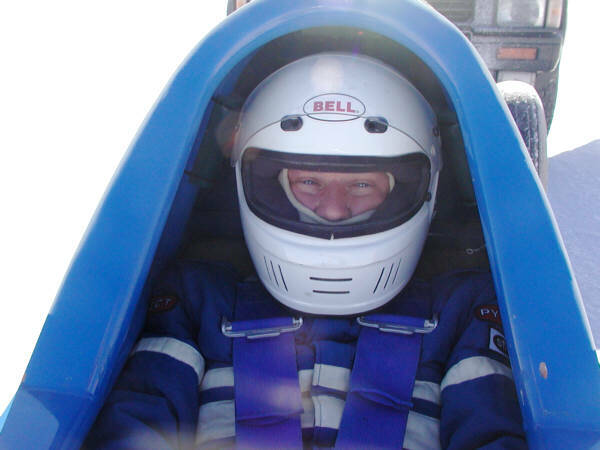 Or just over 1 one-hundredth of a mile an hour better than 200 mph for a speed of 200.015. Astoundingly his previous mile was only 2 thousandths of a second longer (how’s that for consistency?) but it worked out to only 199.996 mph. Sunday afternoon James & I packed up the timing gear and headed home disappointed that we didn’t go faster but confidant that we’ll workout the bugs and be back next year. Wally Ross, who gave up a week of his vacation time to crew for us and only got a few photos and a t-shirt for his troubles. 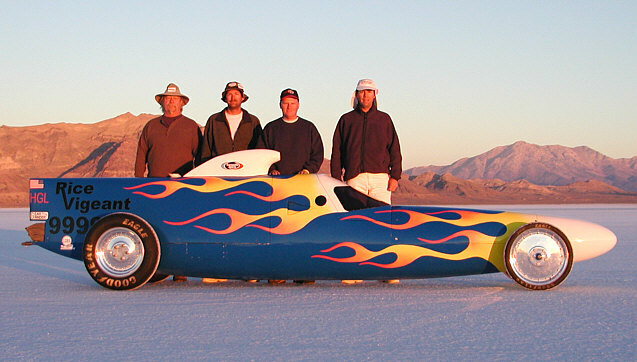 Paul and the gang at Composite Sports (http://www.compositesports.com/ ) who worked long and hard, often late into the night to get the scoop ready for us to take to Bonneville. We really appreciate the effort and quality that they have provided us over the years. Richard from Southwest Superbikes Dallas, Texas, who often sought us out to make his wisdom and knowledge available.